You never know who you are going to bump into at the Dallas Arboretum! 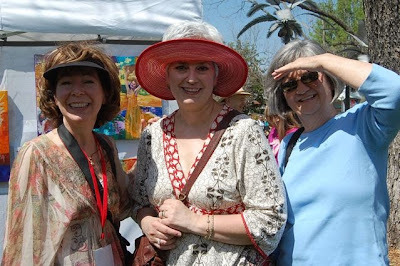 These are my painty pals, Angela Elledge and Ann Rogers who joined me on March 18 for my Artscape show at the Arboretum. We are members of the Some Texas Artists Like to Paint blog, and occasionally we go out to lunch and solve the art problems of the world together. I wish I looked as elegant as Angela does in her red hat! 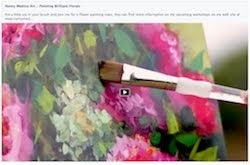 Our theme for the Texas blog this month is tools and I already know what I am going to paint!!! 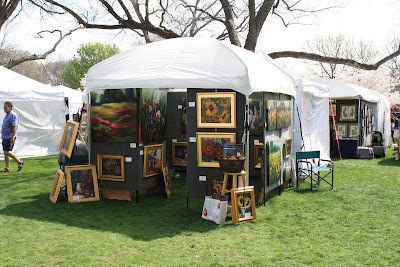 I love the Dallas Aboretum as a venue for an art show. Look at the beautiful space! This is my new light dome tent. It worked really well, even without snowfall to put it to the test this year. 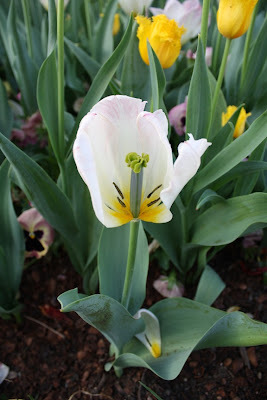 I felt a bit like a peeping tom, getting a look at the inside of this beautiful tulip. This bed of lovelies was right next to our art tents. The morning dew was beautiful, like diamonds. 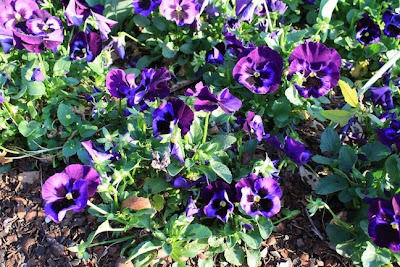 Of course I went running over to get pictures of the purple pansies as soon as I saw them by the DeGolyer House. I do love pansies! These flowers were in a container, and came in all colors. Do you know what they are called? I don't, but I wish I did. Very paintable! 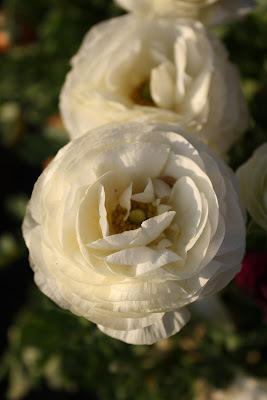 I do believe they may be Ranunculus in the final photo. Love those flowers though I don't have any in my garden. 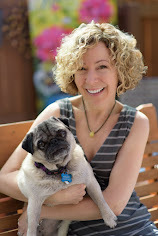 They are quite popular on photo blogs. Your poppies are beautiful, Nancy. Can't wait for the flowers to start bloomin' over here. Do you know how much I ove poppies? ZILLIONS of times.. and you paint them so beautifully. Such a beautiful painting Auntie Nancy. And it is a treat to see your friends standing with you. I recognize Angelina,, because she painted my portrait and my moms love it so. 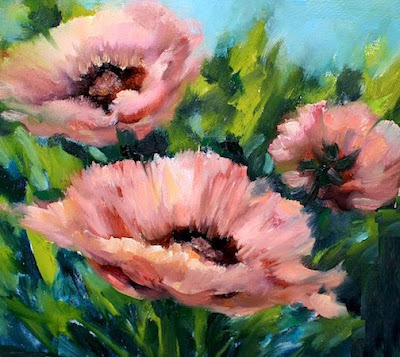 Oh what gorgeous pink poppies, Nancy! Such lovingly painted flowers, soft pink poppies for somebody who is gentle1 I read your customers remarks, Nancy, what a lovely tribute - each of them! ranunculous. So nice to catch up with your wonderful work! Beautiful painting, as always! Yes, those are ranunculus flowers and I photographed them, too. I have yellow ranunculuses on my front doors, love them. By the way, if you have not recently, take a trip to Central Market and check out their flowers, I loved their selection of green flowers today. 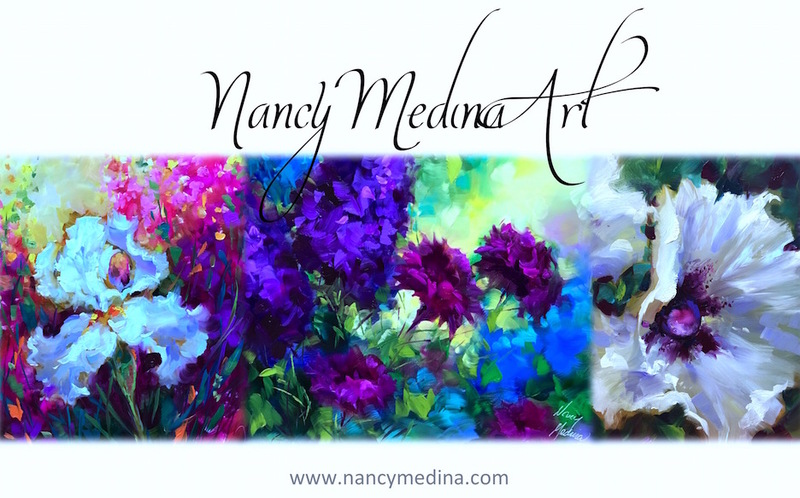 Love the colors in this new painting Nancy...gorgeous. I love your flowers !